Calculates periodic NPV & IRR. Also, you can set a date for every value of cash flow. Fibonacci Lines Analyzer is a powerful application designed to show Fibonacci, Gann and other powerful forex and stock trading indicators. GiMeSpace Mega AI predictor is a program that is using past historical data to predict future data. Obvious applications can be predicting stock market shares and any other hard to predict data streams. It is using highly optimized techniques that automatically adapt to the data that is being used. The techniques are coming from the Artificial Intelligence, Neural Network and Machine Learning science and is used in such a way that maximum learning capacity is provided for hard to predict data. The program is highly optimized for the latest x64 Windows computers. It supports up to 2048 parallel CPU cores/threads and up to 16TB of virtual memory. The more memory and computing power you have available for this program the more effective this program will predict future data. Since it is recommended to use massive amounts of memory, the speed of the calculations are likely limited by the access speed of you memory. For extreme projects you might want to invest in the latest high bandwidth RAM and processors that are able to access this RAM at maximum speed. Using this program: This program will only run on 64bit windows! Although the logic behind this program is highly complex, this program is actually very straight forward and easy to use. When you start the program you will see the main text screen giving you all the information you need. And 8 buttons on top that perform all the tasks that are needed. On the bottom right is a button that can be used to interrupt calculations if you need to interrupt the program. You will have to start the calculations again at a later time. The first button on top will create a new project. First you will be asked to specify the input data format. Meta stock 7 file format is supported but also other standard text format data files like csv etc. Values can be separated by spaces, commas or other characters. Data can be presented in horizontal or vertical format. Also there is an option to sort data on a time label if that is present. Next you will be asked to select a file that contains the first data for all the input streams you want to predict or use. The predicting network will be created according to the number of input streams of the first file. Next you will be asked to allocated memory to be used for the predicting network. Unless you have a very simple problem space, it is recommended to use all the memory you have available. You can also allocated more virtual memory on a fast Solid State Disk by making a fixed size page file on that drive. The initial size of this page file is the size that will specify how much virtual memory is available for this program. Please note that the access to an SSD is still much slower than your RAM and although you will have better prediction results, the learning time will be much longer! 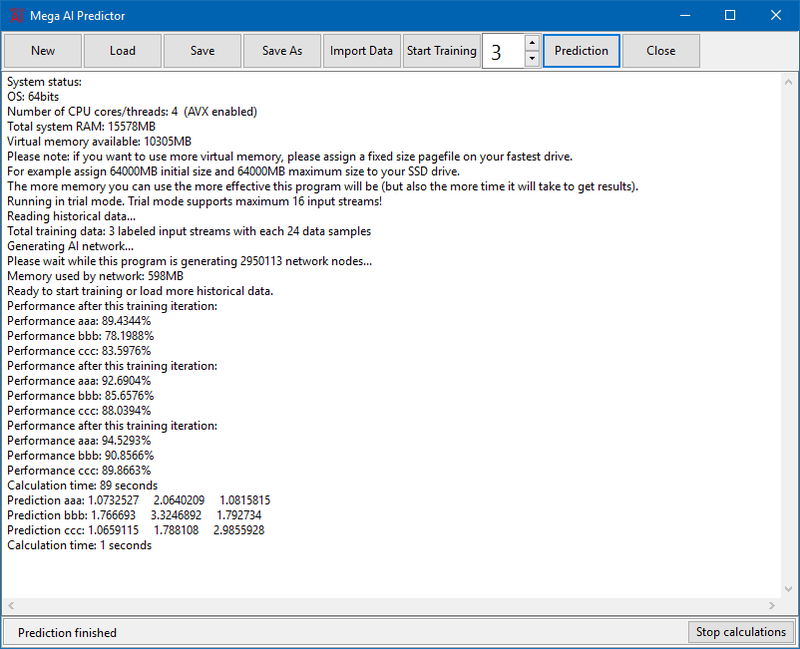 The program will now generate the prediction network, this can take a lot of time to generate! Once a project is generated you can save it and load it again. You can also choose to import more data. For example if you try to predict stock data you might want to import the latest stock data every day. The next step is to allow the program to learn how to predict the data. The more training iterations you do the better your project will perform. After each training iteration the program will specify how successful it can predict the current data. Maximum success will be with a score of 100% but with real world data this will be of course very rare. In general scores of 95% and higher are useful predictions. After successful learning you can start to predict future data. For each input stream a list of successive data predictions will be produced. Exports the text, images and other contents from any PDF document into MS Excel document format, so you can edit and reuse your PDF content. Preserves the original PDF text, layout and bitmap images in the generated Excel document. A standalone program and does not require Microsoft Excel, Adobe Acrobat, or even Acrobat Reader. Preserve the original PDF text, columns, tables, and charts in the output Excel spreadsheets. Provide 2 flexible options for the output Excel: Each page into a single Excel sheet or Combine all pages into a single Excel sheet. 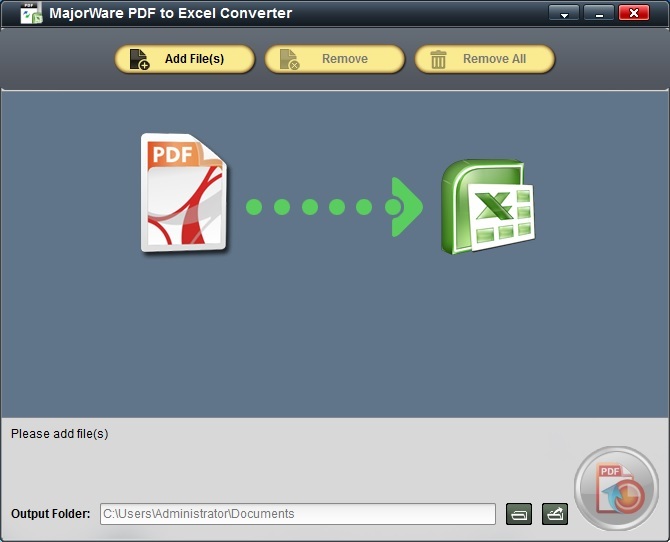 Support exporting PDF to Microsoft Office Excel 2003/2007/2010/2013. March 8, 2016 Business & Finance, Business Finance, SoftwareTed Chalmers Entertainment, Inc.
Excel Database and Volume Momentum Spreadsheets for UK stocks. Predicting Acquisition Price Jumps with Volume Signals. Requires any version of Excel. Check our website at www.xdatabases.com for further information. Cash management – A/P & A/R control Excel workbooks. Is the clock ticking for any of your major customers or suppliers? You can run quick and easy checks on the solvency of companies you rely on to deliver services to you and to buy from you using this Excel Solvency workbook. Our Business Solvency workbook employs all the multivariate analysis equations published by Edward Altman. Altman is the Max L. Heine Professor of Finance at the Stern School of Business, New York University. In the workbook supplied you can simply enter two comparative sets of financial data for any company (including your own). The Altman Z scores are readily computed using the multivariate formulas provided by Professor Altman. Windex 2008 calculates all major financial ratios in Excel. FILE CONVERSION. Convert Excel, Word files to pdf documents without any requirement for Acrobat using our web software add web inks for safe secure document transmissions. Convert PowerPoint 2003-2007 to Flash presentations. 25 Excel files in total. 23 upload and run in Google Docs Spreadsheets, plus 2 Cash Flow Forecasting with file sizes that are greater then the Google Docs limit which enables larger data volumes. You can download a combined zip file now or order the CD edition. Become a member of our 4,000 members club swapping foreign exchange at mid market prices. No bid-offer pricing. Save on all fx deals. No charges.